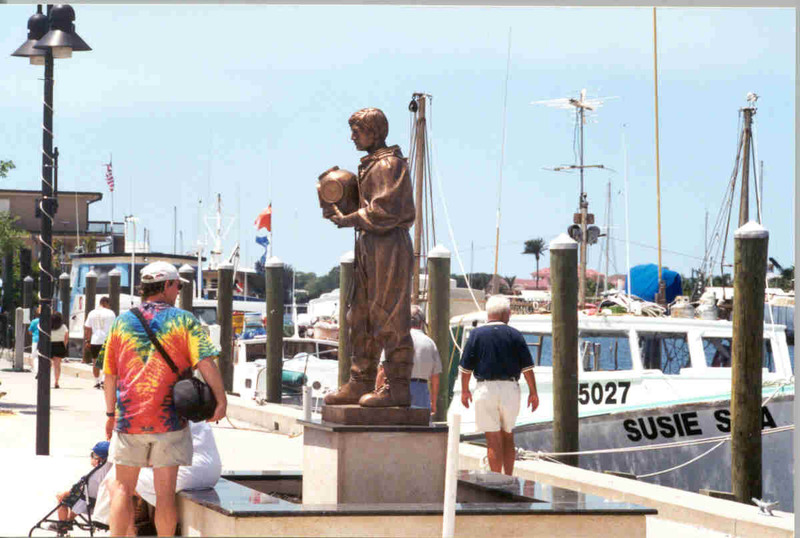 A family stops along the Sponge Docks to view a statue commemorating Greek sponge divers who immigrated to Tarpon Springs in the early 1900s to harvest sponges in the Gulf of Mexico. 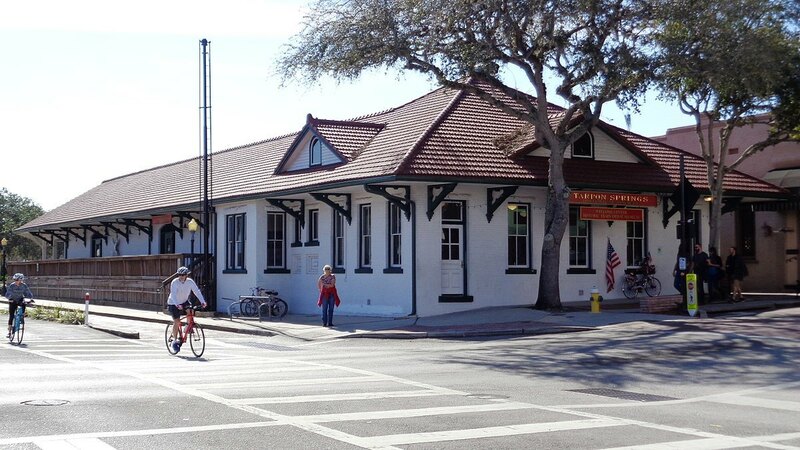 The restored railroad depot in Tarpon Springs now houses the Tarpon Springs Historical Society and a visitor's welcome center. Tarpon Springs, Florida, (population 21,000) is located by a series of bayous feeding into the Gulf of Mexico. The area was first settled after the Civil War, and in 1887 Tarpon Springs became the first incorporated city on the peninsula that would later become Pinellas County. Tarpon Springs became a popular winter resort for wealthy Americans in the late 19th and early 20th centuries. Yachts, steamers, sailboats, and fishing vessels plied the waters of the city, as laborers and merchants were also enticed to Tarpon Springs by cheap land. Sponges were discovered in the area in 1873, and the sponge trade became Florida’s most lucrative business by the late 19th century. Greeks brought in diving crews, and Tarpon Springs was the world center of the industry by the early 20th century. In 1938, a red tide (a toxic bloom of algae) infested the beds and many of the sponges died; however, the industry has seen a modest revival in recent years. Professional sponge divers still search the waters off the coast of Tarpon Springs, diving as deep as 150 feet. Most of the sponge boats are owned and operated by people of Greek descent, and the town’s Greek character provides a strong base for tourism. The downtown buildings on Tarpon Avenue and the surrounding historic homes were declared a National Historic District in 1990. The National Register of Historic Places-listed Train Depot, built in 1909 and renovated in 2005, serves as a museum, complete with old ticket booths, rail switches, and other memorabilia. The Heritage Museum of Tarpon Springs interprets the history of Tarpon Springs as well as its marine environment. Other attractions include historic walking tours, the 1883 Safford House museum, and the Tarpon Springs Sponge Docks, where five boats listed on the National Register of Historic Places are moored. Each year, the community celebrates the Greek Orthodox Epiphany holiday on January 6, with church services, a procession, and a daylong festival featuring Greek music, dancing, and food.